U.S. 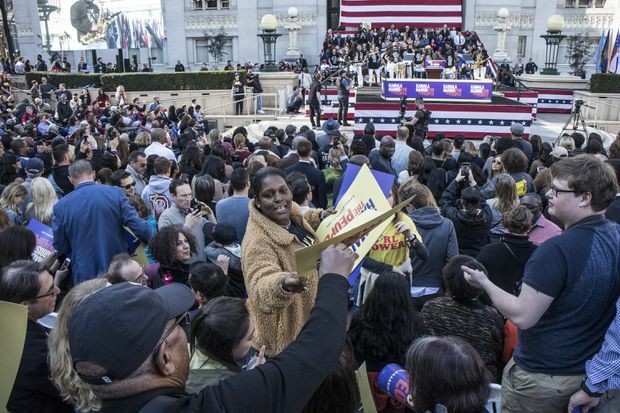 Senator Kamala Harris during a rally for the launch of her 2020 White House campaign on Jan. 27, 2019, in her hometown of Oakland, Calif.
U.S. 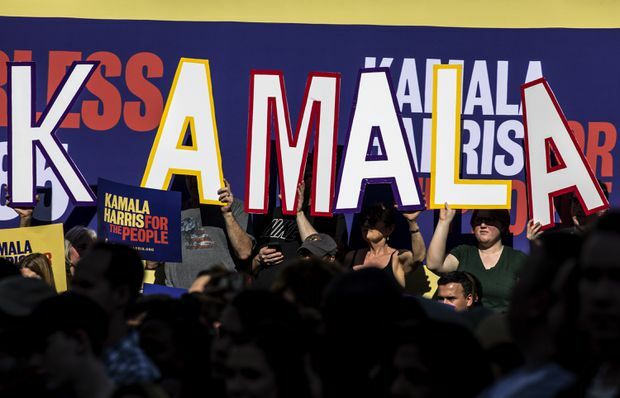 Senator Kamala Harris strode onto the stage beneath a giant American flag in the California sun looking every part a star candidate in the Democratic Party race to challenge U.S. President Donald Trump. 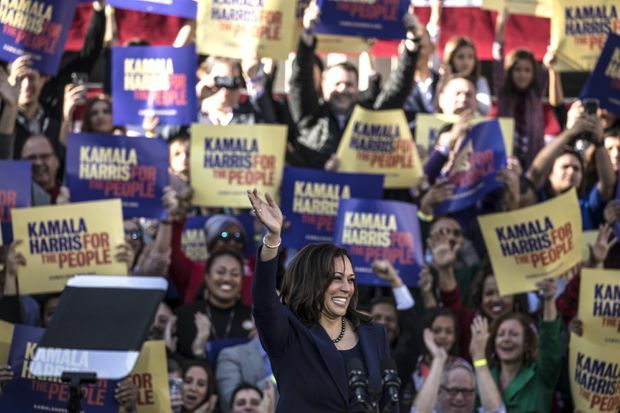 In a speech that never mentioned Mr. Trump by name, Ms. Harris, the first-term senator from California, launched her presidential campaign by positioning herself as a fighter who can stand up to bullies, a career prosecutor who has been able to walk the line between protecting the public and supporting the vulnerable, and – as the mixed-race daughter of immigrants – someone who can unite a divided country. Ms. Harris, 54, has garnered early attention in what is expected to be a crowded race to become the 2020 Democratic presidential nominee, the latest female contender in a race where voters who are women and visible minorities are expected to play a key role. Ms. Harris is the latest female contender in a race where voters who are women and visible minorities are expected to play a key role. 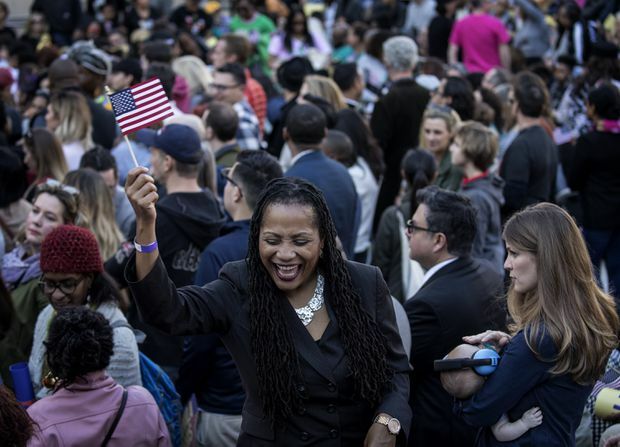 The daughter of academics from India and Jamaica who spent her high-school years in Montreal, Ms. Harris rose quickly through the San Francisco district attorney’s office to become California’s first female and non-white attorney-general. A long-time prosecutor, she has crafted a reputation as a savvy debater in the Senate. As a junior senator, Ms. Harris is a relative newcomer to federal politics compared with other Democratic candidates such as Senators Elizabeth Warren from Massachusetts and Kirsten Gillibrand of New York State. And with more than a year to go before the first Democratic primaries, the rumoured entry of Vermont Senator Bernie Sanders or former vice-president Joe Biden, who now tops the polls, could upend the race. Still, Ms. Harris has generated early excitement thanks to a compelling personal story and her performance in public grillings during confirmation hearings of White House nominees such as U.S. Supreme Court Justice Brett Kavanaugh. In California, where she was once expected to run for governor, she is known as an aggressive fundraiser who has courted donors in the technology and entertainment industries. Her presidential campaign raised US$1.5-million within the first 24 hours. She also boasts a strong network within the Democratic Party. She co-chaired Barack Obama’s 2008 campaign in California, while her sister, Maya West, was a senior adviser to Hillary Clinton’s 2016 presidential bid. Ms. Harris is also seen as the most promising candidate to marshal the African-American voters who helped elect Mr. Obama, but stayed home for Ms. Clinton. But in a campaign that is expected to attract a slew of high-profile establishment figures and progressives who have mobilized as the Trump resistance, Ms. Harris is carefully crafting a middle ground. Analysts say she is positioning herself as the rare candidate who can appeal to the Democratic Party’s left wing with messages on single-payer health care and tax cuts for low-income families, while assuaging moderates by touting her law-enforcement background. She is also seen as the most promising candidate to marshal the African-American voters who helped elect Mr. Obama, but stayed home for Ms. Clinton. She announced her run for the presidential nomination on Martin Luther King Jr. Day and at her alma mater, Howard University, the historically black college in Washington. She eschewed early-voting states of Iowa and New Hampshire for appearances at an African-American sorority in South Carolina, and is opening campaign offices in the racially diverse cities of Oakland and Baltimore. Ms. Harris has sought to cast herself as a “progressive prosecutor,” even though she has previously campaigned as a tough-on-crime candidate. Ms. Harris' presidential campaign raised US$1.5-million within the first 24 hours of being launched. Whether she can prove that she is progressive enough for the left wing of the Democratic Party, which has been energized in the Trump era, will likely be the key issue for her campaign, analysts say. Elected San Francisco’s district attorney in 2003, Ms. Harris refused to seek the death penalty in a police officer’s murder. But as attorney-general, she fought a federal ruling that deemed California’s capital-punishment system unconstitutional. She revamped a program that deferred convictions against non-violent, first-time offenders who enrolled in vocational training. But she also launched a crackdown on parents whose children skipped school, prompting criticism that the measure punished poor families. In 2012, she drew national attention when she walked out of a negotiations with banks over foreclosure abuses, eventually negotiating a US$18-billion mortgage-relief package for California homeowners. But critics point to her refusal to charge OneWest Bank, the financial institution formerly owned by Treasury Secretary Steven Mnuchin, who donated to Ms. Harris’s 2016 Senate campaign. For her supporters, however, Sunday’s rally was the start of a historic moment.